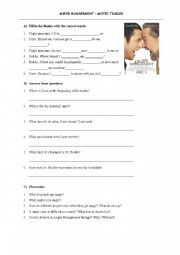 Activities based on certain scenes from the movie "Meet the Parents". 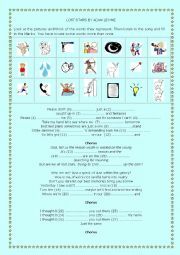 There´s a worksheet for the student and one for the teacher. Activities based on a scene from the sitcom Friends. 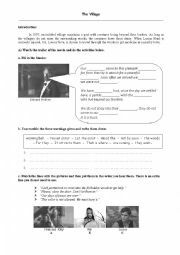 (Season 9 - Episode 8)Students have to answer questions and fill in the blanks.It includes a summary of the episode for those who are not familiar with the show.It´s perfect to be used for Thanksgiving! Activities based on the singer´s biography, the video clip of the song and the lyrics. Activities based on the trailer of the movie "Anger Management". Students have to listen and fill in the blanks and answer questions. A set of questions related to the topic is also included. 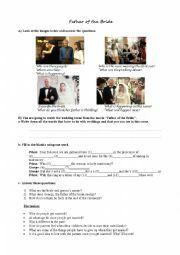 Activities based on the movie "Father of the Bride". It includes picture description, prediction making, listening for detail and discussion questions. Activities based on the trailer and a scene from the movie The Village. 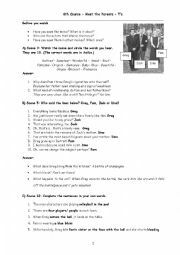 Sts have to fill in blanks, unscramble lines, answer questions and match lines with pictures.There are also follow-up questions for discussion. 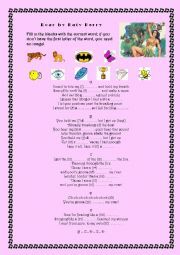 Students listen to the song and complete the lyrics by using a set of images.